Hellnotes gives WHEN THE NIGHT COMES DOWN a hot review! The savvy writers featured in When the Night Comes Down are skillful tellers of tales. Arch, wise and warped, this collection has much to offer: A savory supernatural sampling of choice works. Dark Arts Books was founded in 2006 with a simple game plan in mind: each year they’d publish a “sampler” anthology featuring four authors writing stories of horror and the fantastic. So far, so good. Their first five books attracted talent such as Christa Faust, Cody Goodfellow, Gary A. Braunbeck and Sarah Pinborough. Their sixth book, When the Night Comes Down, is similarly loaded and has been receiving rave reviews since it’s debut at last month’s World Horror Con in England. Editor Bill Breedlove was kind enough to answer a few questions for us. 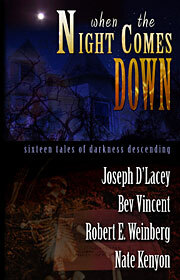 Shroud Magazine clocked in this week with the 2nd review of our 6th and latest anthology, When The Night Comes Down. ‎The review starts out noting: Continuing its series of author samplers, Dark Arts Books notches another mark on its belt with its latest compilation, “When the Night Comes Down”. Featuring some of the best tales to date by four outstanding writers, Dark Arts proves that when it comes to collections, contributor quality ranks far higher than quantity. Read the whole review at: shroudmagazinebookreviews.blogspot.com.